Abe Pieciak - fisherman, chef, artist. 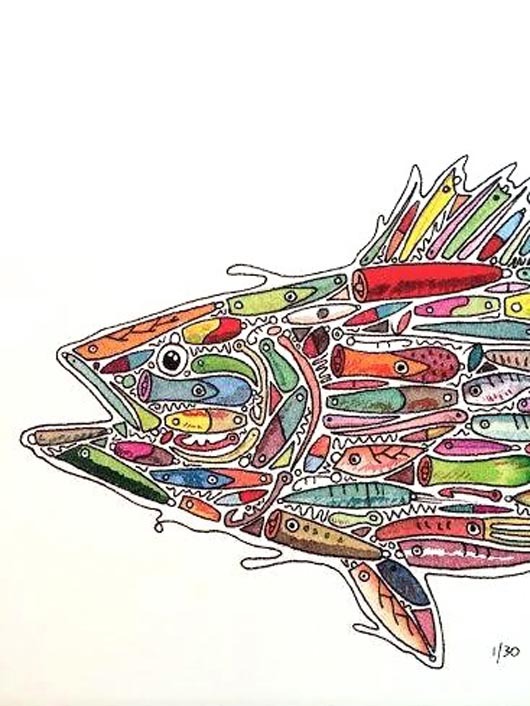 Last year, when Martha’s Vineyard Striped Bass and Bluefish Derby chairman John Custer was contacted by a local artist who wanted to donate prints for the tournament awards ceremony he didn’t think much of it. “I didn’t have any expectations. I had never met him before,” said Mr. Custer. 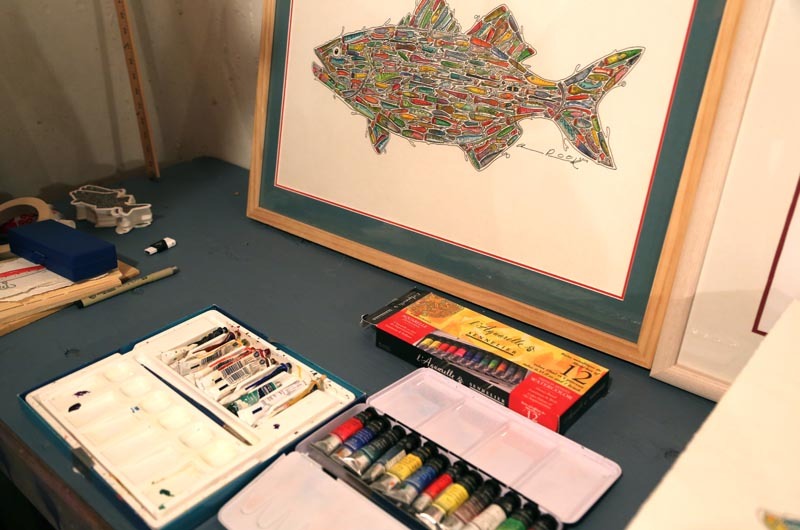 The artist was Abe Pieciak, a local fisherman and chef whose watercolor painting of a striped bass, the outline of which was filled in with colorful lures, quickly created a buzz. Four framed prints of Mr. Pieciak’s striped bass “lure fish” were given out at last year’s awards ceremony. “We didn’t even have time to promote it, but he got so much word of mouth publicity because it was such a unique piece of art,” said Mr. Custer. Mr. Pieciak grew up in Maine and has been a fisherman all his life. Since moving to the Vineyard five years ago, he has worked at Lambert’s Cove Inn, the Ocean Club, Kitchen Porch Catering and the Harbor View Hotel. He spent this past winter living in New York city with his girlfriend Caitlin Thurbuena, where he continued to cook and work on his lure fish series, painting false albacore, bluefish, bonito, large mouthed bass and trout. But what started out as a hobby quickly became much more. Last January, Mr. Pieciak created the Lure Fish Facebook page and offered prints for sale. After a few sold, he decided to make a new striped bass and put the prints up for sale. So he started a website which served as a showcase for his work, but also helped to organize sales. From there, the momentum continued. His stepfather and his mother, also an artist, offered to help with the clothing part of the business from their home in Maine, which includes T-shirts, sweatshirts and, in the future, aprons and canvas beach bags hand sewn by his mother. This spring he returned to the Island and reached out to Mr. Custer, offering to donate more work to the derby. This time, Mr. Pieciak planned to create and donate 35 prints to the competition — one to be given away each day of the derby, plus two framed prints for the awards ceremony. The prints feature the four derby fish: striped bass, bluefish, bonito and false albacore. 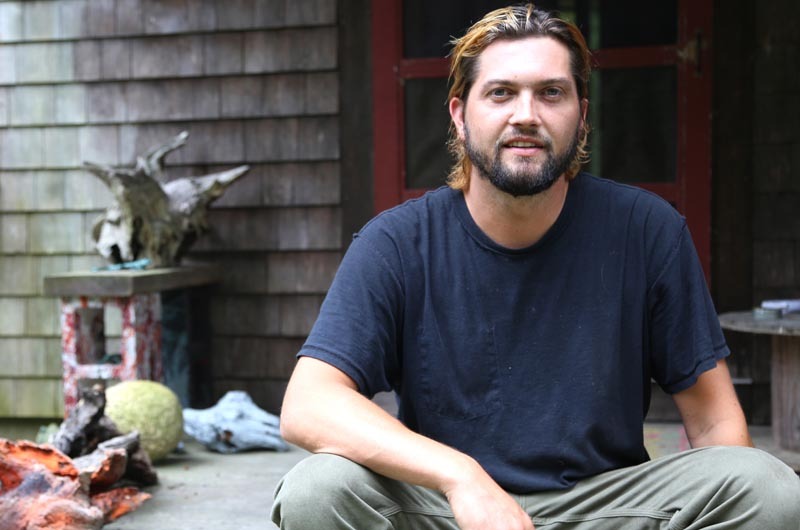 As he settles into his winter rental in West Tisbury, Mr. Pieciak has big plans for the off-season. 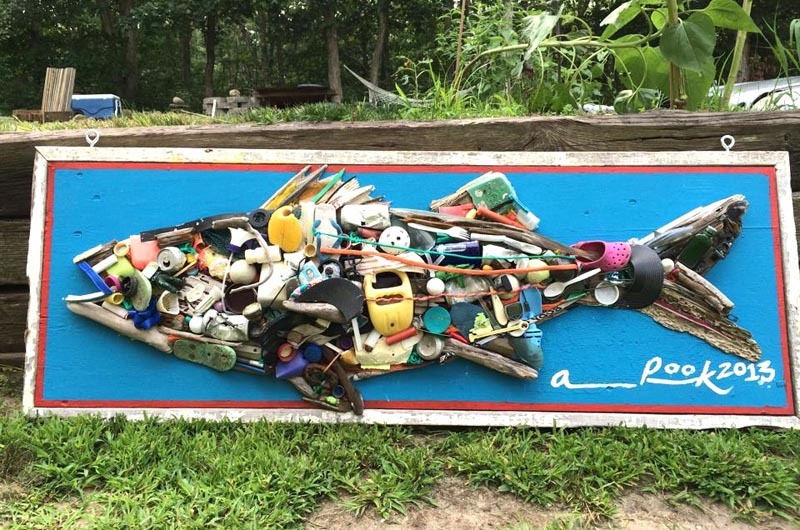 He hopes to paint 50 different kinds of fish, including some of the southern fish, which he has had requests for. He also plans to have an art show this spring featuring original watercolors. As for his more immediate plans, Mr. Pieciak said he will be fishing every day of the derby. So what does he love more, fishing or painting? Regarding the photo caption, I believe it's "jetsam". It sure is. Thanks to the reader for pointing out the error.